No advance registration. Space is limited. Explore "Ocean Worlds" with Gene Perry of NASA's Jet Propulsion Laboratory. Learn about research and technology from NASA missions such as Cassini, Europa Clipper, Insight, and more! 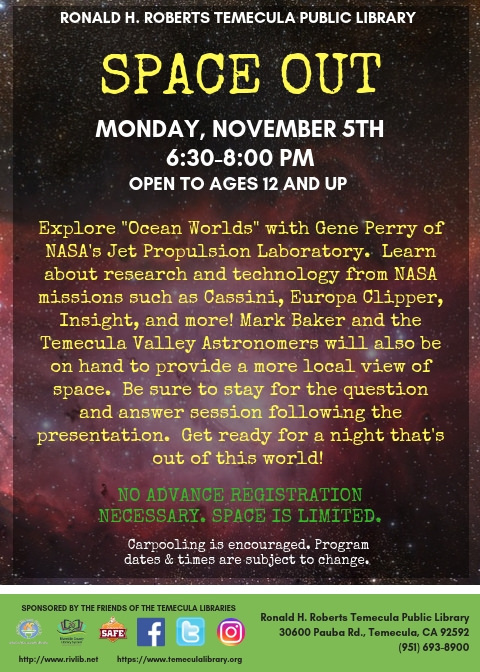 Mark Baker and the Temecula Valley Astronomers will also be on hand to provide a more local view on space. Be sure to stay for the question and answer session following the presentation. Get ready for a night that's out of this world! * Carpooling is encouraged. Program dates & times are subject to change.